When you head offshore your safety depends on stability, both upright and ultimate (the heel angle at which you don’t recover from a knockdown). Given today’s software and computing power, calculating stability is a relatively straightforward exercise. This is required for commercial vessels, larger yachts, and generally for any flag state/class certification such as MCA, RINA, ABS, etc. We would not go offshore without this data, and we don’t think you should either. 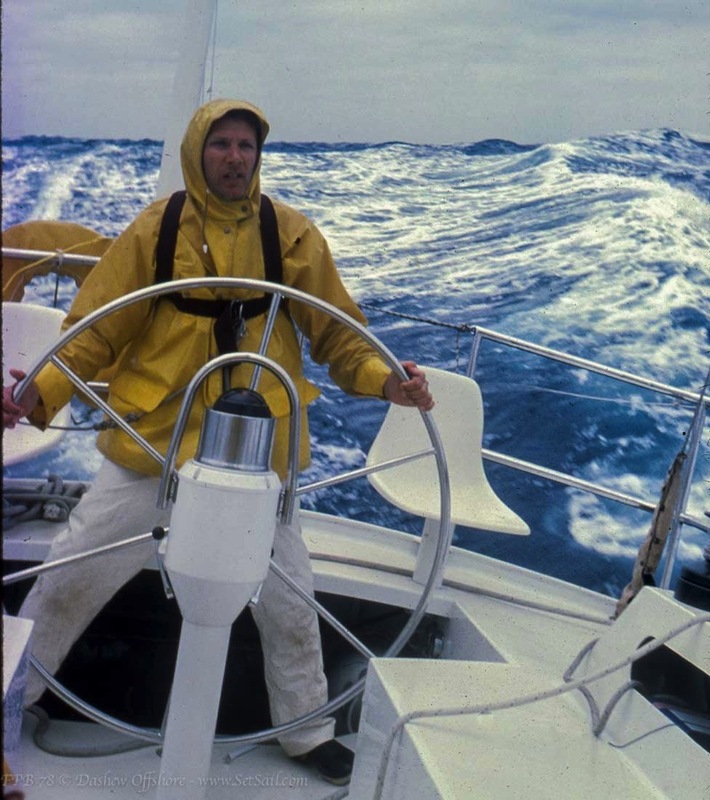 The lead photo was taken aboard the FPB 83 Wind Horse during a blow gusting to 50 knots, after the front had passed, leaving seas from multiple directions. The wave in the background is 25-30 feet/7.5-9 meters. For a video of this passage see the link at the end of this post. Knowing the capabilities of your yacht, its strengths and its weaknesses, leads to better decision making. A key part of this is the stability data and how it is affected by payload. Checking stability is a simple process. There are numerous design and engineering firms who can organize this for you. If you are building or buying a new or used yacht for offshore cruising, insist on proper stability figures. If you are low on ultimate stability, which does occur, ballast can be added to improve the situation. We want to start out with two example videos. The first is some fascinating footage taken aboard FPB 64-6 Grey Wolf in tide against wind generated seas (overfalls), with the stabilizers off. She is testing what could be the ultimate survival storm tactic, jogging into breaking seas. 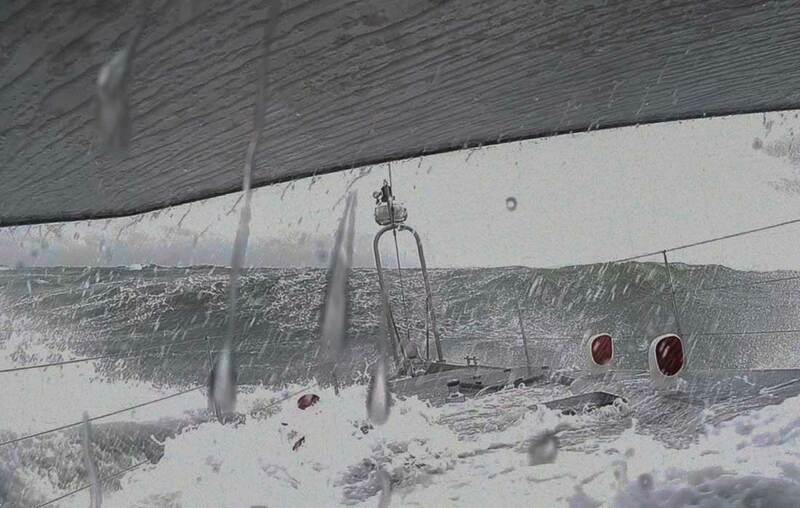 This took place recently off the Needles near the Isle of Wight in the UK’s Solent, in a southwesterly gale, in shallow water, outside the marked channel off the Isle of Wight. The closely spaced breaking seas are similar to the breakers on top of larger waves in open ocean storms. In terms of heavy weather, possibly even a survival storm, we have always assumed that in most cases, if headed towards a favorable destination, we’d run off before a real blow…until we ran out of steering control. At this point it would be time to turn around and jog into the breaking seas. We have learned several important lessons from the video. First, the distribution of volume and waterline shape works well in these breakers–what would be called survival seas in many yachts. The bow lifts to the oncoming seas, sufficiently so that little actual water comes on board, and what does is quickly shed. Second, with stabilizers off the heel recovery is rapid, with no indicated tendency to rhythmic rolling that can be so dangerous. Third, the prop appears to have sufficient blade area to handle the chaotic disturbed water flow while keeping the boat moving at cruising speed. It might also be of interest that storm covers are not required on the forward facing windows in these conditions. There is a detailed analysis of this video here. Operating in these conditions is not something we recommend anyone else try. Better to stay in the marked channel. But we are very pleased to have real world confirmation of what was before a theoretical exercise. Keep in mind that the only way this all works out is with a low center of gravity and high ultimate stability. Now a different video, this one of a trawler capsizing while running downwind. The example below bears close study for anyone who is planning to head offshore. For a detailed analysis of this trawler capsize click here. There are a number of contributing factors to this unhappy outcome, chief of which is lack of ultimate stability. We cannot emphasize enough that your life, and those who are aboard with you, may depend on your stability numbers. This data will give you and all those on board the confidence to know when to venture out, and when to stay put. In the rest of this post we’ll take you through the stability analysis process, so you will know what to look for if considering a yacht for serious cruising. We’ll use the FPB 78 as an example, since this vessel is front and center in our psyche. To calculate ultimate stability you need to know the following: Vessel weight, the vertical center of gravity (VCG), and have a 3 dimensional computer file of the hull, deck and super structure. Vessel weight can be ascertained by measuring topsides and comparing their height above the waterline to the lines plan of your yacht. If you’re building new, this is achieved with a detailed spreadsheet weight budget, later confirmed on the water. Travel lift operators will also offer an opinion on weight, but we find these numbers are often inaccurate. 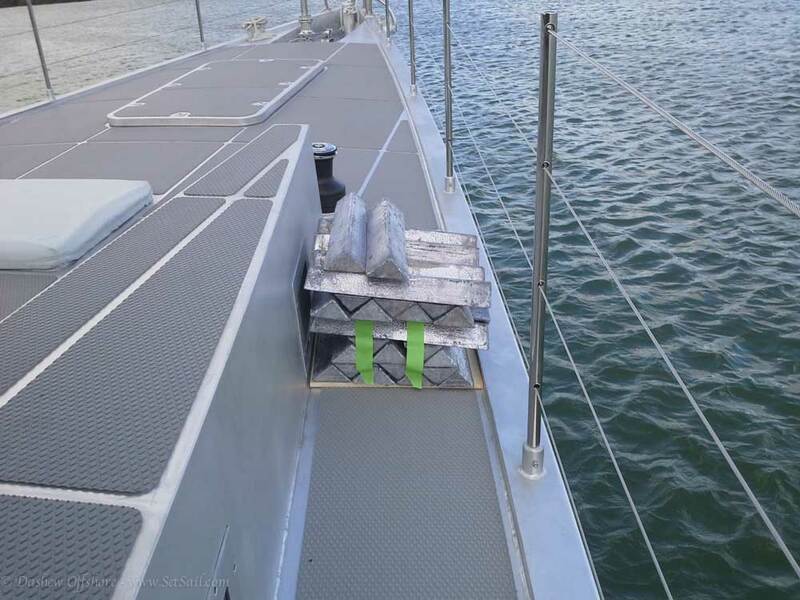 Note: It is a good idea to have flotation reference marks on the hull – ours are welded in place – from which you can compare the distance above the water to the lines plan for checking displacement. The vertical center of gravity (VCG, the location of the vertical center of the yacht’s weight): This starts off on the spreadsheet and then is confirmed with an inclining test, where a known weight is suspended from the end of a boom or placed on the deck edge, and the heel generated is then measured. In the photos below, the first shows FPB 64-4, and then FPB 97-1, going through a stability test. With heel angle, displacement, and a hull shape definition, the vertical center of gravity can be quickly computed. 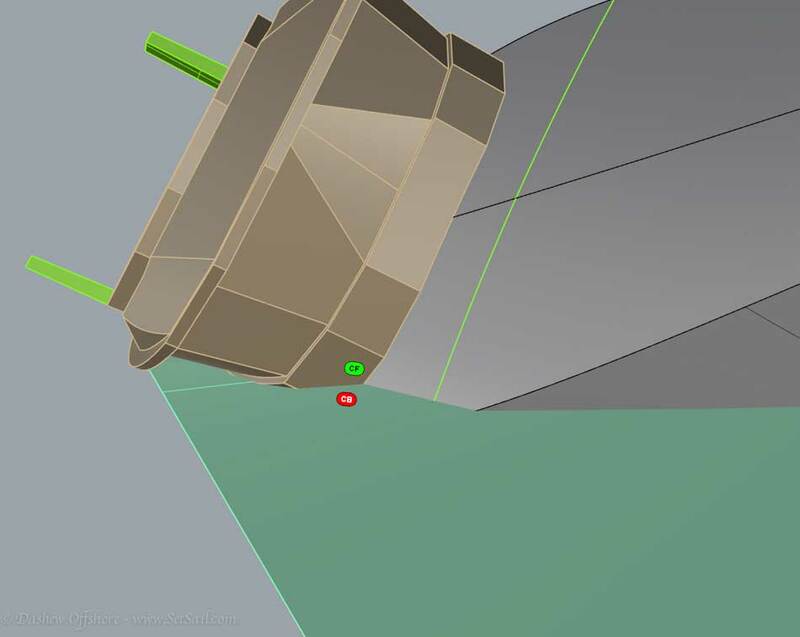 Note: If a 3D definition of the hull is not available, there are a number of sailboat handicap systems that use a measuring tool to build a 3D model. The folks who do the sailboat hull shape measurements can also do a power boat. This model allows you to run a variety of simulations. 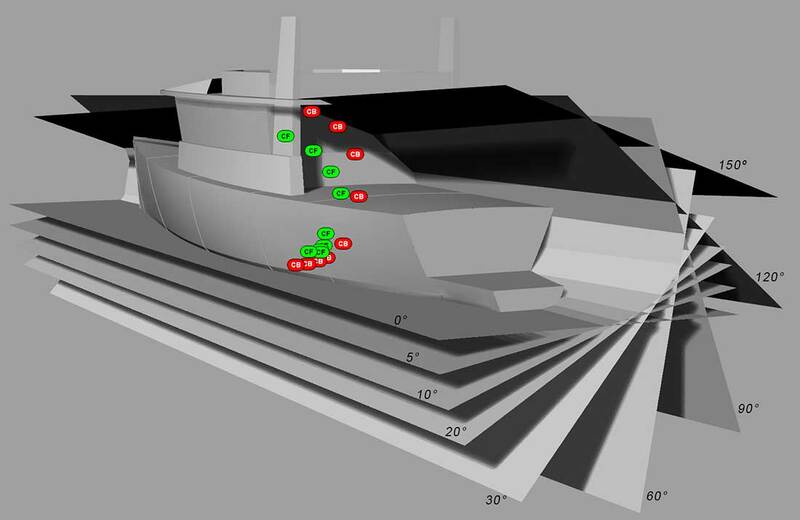 For ultimate stability calculations, where the boat heels beyond its deck edge, the computer requires a 3-D model of the deck and super structure. If an accurate super structure definition is not available, it can be approximated with a crude box shape. Now the fun begins. The rectangular planes in the above image represent the horizontal sea surface and show how the FPB 78 will float at a variety of heel angles given a certain displacement and center of gravity. During this process the computer develops a stability number at each heel angle, and a stability curve is drawn. CB and CF stand for the center of buoyancy and center of flotation at each heel angle. This is not guesswork, seat of the pants analysis, or gut instinct. With the weight, vertical center of gravity, center of buoyancy and center of floatation data, and hull and house volumes, this is simply a computational exercise. The float plane conditions are then checked for “down flooding”, the point at which critical (typically open) items like Dorade vents, engine room vents, and entry doors are immersed. If you wade through all those planes above and pick out the four most extreme heel angles, it will be seen that they do not impact the engine room air intake on the aft deck. And a knockdown to starboard will barely wet the entry door. In this case the FPB 78 is sitting on its 30 degree heeled waterline. Note the substantial freeboard – distance from float plane waterline to deck edge. 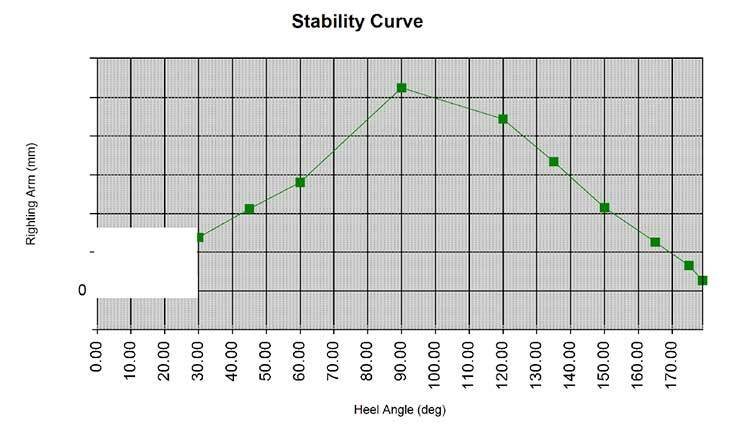 With some motor vessels this heel angle may be close to its stability maximum (with the FPBs they have only just begun to put their stability curve to work). Here we are at 60 degrees. The coaming vents are now underwater, but these are sealed from inside the boat, which would be the norm in advance of heading offshore. At 90 degrees the stability curve (an example of which is shown a little later in this post) is exerting maximum recovery force. At this heel the engine room vent (aft deck) is still clear of the waterline and the main entry door is barely awash. With the physical measurements, the hull definition, and any one of a variety of hydrostatic software packages, the stability curve, and point of vanishing stability, can be quickly computed. 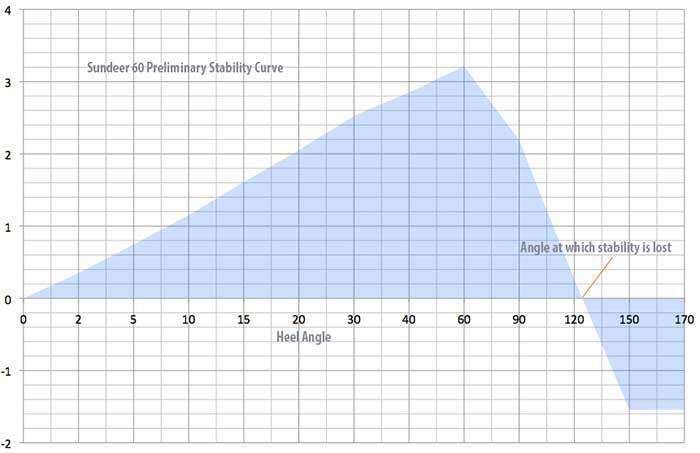 For all of our FPBs, with correct management of liquids, their stability curve remains positive well past even the 120 degree heel shown here. We consider 120 degrees a minimum for the limit of positive stability. This is one of many stability curves we have run for the FPB 78 in various payload configurations. Heel angle is shown across the bottom running from level (0) on the left to 180 degrees (inverted) on the right. We have blanked out the initial numbers as they relate to normal heel angles and are not important for what we are discussing – and a lot of folks in our industry would like a look at the upright data. We are also not indicating the vertical center of gravity or displacement for the same reason. What this does show you is that ultimate stability peaks around 90-degrees and remains slightly positive even fully inverted. To be clear, these yachts will recover from a capsize, and if they wouldn’t, we’d not be going offshore in one. You will rarely see a curve like this for a motor vessel, unless she is a surf capable rescue craft. Lots more details will be found in the links at the end of the post. Our Deerfoot, Sundeer, and Beowulf series of sailing yachts have accumulated two million sea miles and 22 circumnavigations without a serious roll over incident. A stability curve that we’d shoot for with one of these sailing yachts is shown above. Not as powerful as the FPBs in terms of ultimate stability, but well proven nonetheless. Which brings us to “skid factor” and how we learned about it. The photo above was taken on a very cold November 1982 morning, after running off before an unforecast northeaster in the Gulf Stream aboard the 62-foot cutter Intermezzo ll. During the height of this experience it was blowing 60+. With the wind against the Gulf Stream current the seas were continually breaking. As long as the helmsman kept the boat running slightly off downwind, and correctly adjusted course at the end of each surf, we were fine. On three occasions steering errors occurred, we were slapped around beam to the breaking crests, and thought we were about to be rolled over. Our cutter would then skid sideways on her increasingly immersed topsides and never even got her spreaders wet let alone the mast. Rounded bottoms, in particular avoidance of bottom to topside chines, reduces heeled resistance. The smaller the heeled “draft” the better yacht will skid. Narrower hull beams skid better than beamy hulls. How keel, rudders, stabilizers, etc. project into the water with heel is a major factor. Ideally, as you heel most of these projections are lifted clear or close to parallel, with the direction of skid so as to offer minimum resistance. Although the preceding is in the context of extreme conditions, skidding also works in more moderate sea states, making for a more comfortable passage and less heel when those occasional over-sized crests meet up with your topsides. You could almost say the FPBs have more ultimate stability than needed, unless something goes wrong, like a flooded compartment. In that case there will be a major loss of stability and that extra righting force becomes critically important. Which is where the next section of this post comes in. 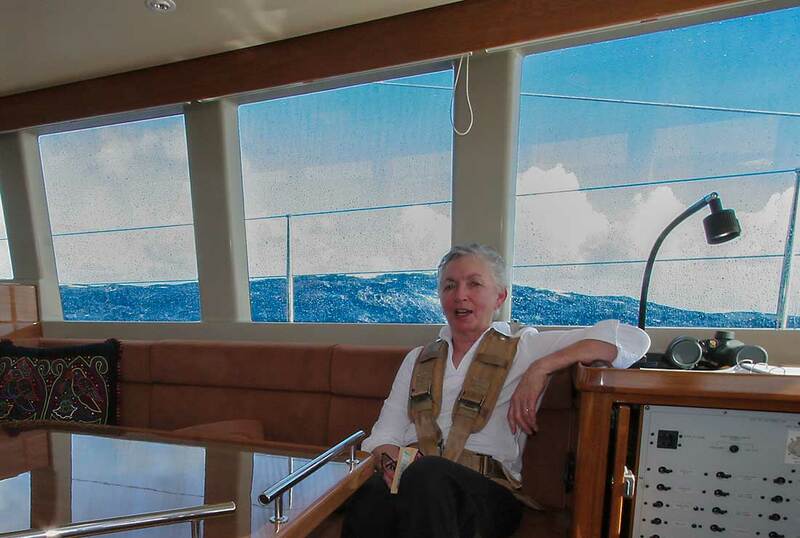 Most seagoing yachts (and all coded vessels) have several watertight areas. The FPB 78 has seven watertight compartments, and the next step is to assess the trim and stability with various sections flooded. In the image above the lazarette and swim step are left open, and the boat is run through the stability program. 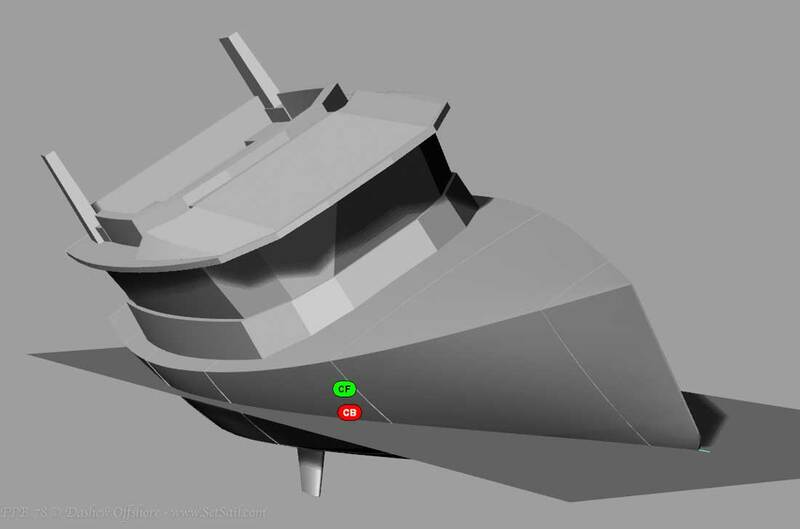 As you can see, the FPB 78 has a modest amount of stern down trim. Stability is still quite favorable. The stability is then checked with various watertight sections damaged at different heel angles. The worst case, with the aft accommodation zone flooded, is shown above. Correctly loaded, the FPB 78 becomes stable at around six to ten degrees. As it heels it becomes more stable, and is self rescuing past 120 degrees. When you heel beyond the deck edge being immersed, structure above the deck and/or the house volume enhances positive range of stability. For this to work watertight integrity must be maintained. If a window blows out or a door opens, the down flooding that results will capsize the boat, not to mention sinking it. This is why you will never see opening windows or side opening doors on our designs. 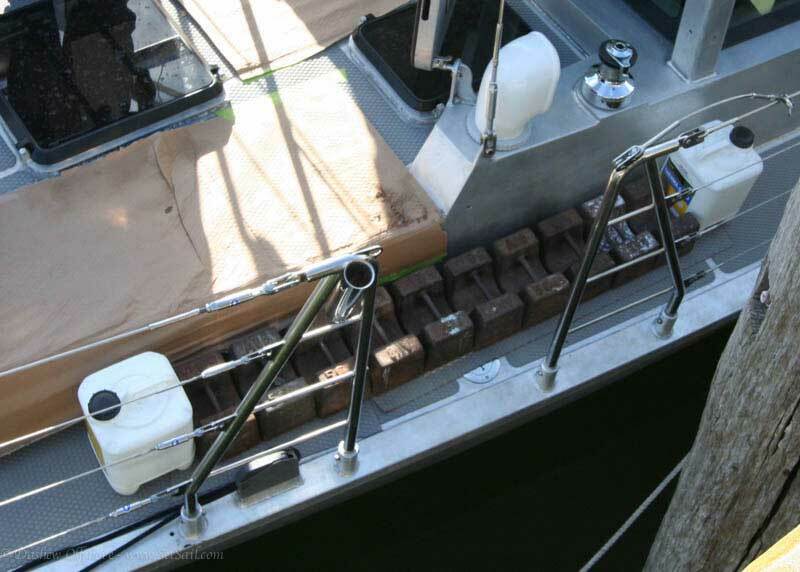 As an owner or operator you can improve – or degrade – your vessel’s stability numbers by how she is loaded. Adding weight up high, dinghies on the cockpit overhang for example, raises your vertical center of gravity and lowers stability. On the other hand, if fuel and water tanks are below the vertical center of gravity, as these are filled they lower the overall vertical center of gravity and enhance stability. In the case of the FPBs, with massive integral fuel and water tanks, filling tanks results in substantial stability benefits. One last note: While the correct stability numbers are critical to a safe boat, we want to reiterate the importance of being able to avoid heavy weather in the first place. The most essential safety elements in this regard are speed and steering control–a fast, efficient vessel able to outrun and maneuver around the inevitable unforecast scenarios. Anything you can do to improve average speeds, from polishing props and bottom before departure, to having your boat correctly trimmed, and taking advantage of the most up-to-date weather technology, enhances your safety. Below are several links that further discuss the issues of stability and safety at sea. This entry was posted on Tuesday, December 2nd, 2014 at 8:36 am and is filed under FPB 64, FPB 78, one. Both comments and pings are currently closed. I don’t know what this vessel’s Stability Curve looked like. It would be interesting to see it.